Despite leading with less than three minutes to play, the North Dakota State men’s basketball team fell to Indiana Purdue-Fort Wayne this past Saturday, 92-88. Paul Miller and A.J. Jacobson both scored 21 points, but the Bison could not hold off the Mastodons’ torrid second half. NDSU and Fort Wayne exchanged leads early in the first half, but Miller scored on three consecutive possessions to put the Bison in front. Ensuing 3-pointers from Jacobson, Jared Samuelson and Dylan Miller saw the Herd’s lead quickly grow to 13. The Mastodons briefly cut the lead down to single digits, but the Bison answered with timely baskets. Fort Wayne scored on two straight possessions, but NDSU responded with a Tyson Ward dunk and a Rocky Kreuser’s trey. Shortly thereafter, NDSU’s two seniors connected from beyond the arc to bring the Bison’s advantage to 15, their high-water mark of the night. The Bison took the locker room with a 51-40 lead, thanks to shooting 66.7 percent from the field and 53.3 percent from three. The second half was virtually a carbon copy of the first, but it was the Mastodons who turned the tables on NDSU. Fort Wayne went to work on the Bison’s 11-point lead quickly and had the game tied by the 9:18 mark. Guards Kason Harrell and Bryson Scott combined to score 25 of the Mastodons’ 32 points in the comeback effort, knotting the game at 72. IPFW ripped off a 10-0 run shortly thereafter, taking advantage of the Bison’s cold shooting and foul trouble. NDSU missed six shots and quickly saw the Mastodons race past them. Fort Wayne scored eight of their 10 points from the charity stripe. A four-point lead ultimately became a six-point deficit. The run spanned 3:17, and it was not until half of a minute remained that the Bison hit another shot, a triple from Jacobson. The Fargo native sunk two free throws on the next possession to give NDSU one last chance down two with 23 seconds to play. Harrell turned the ball over for Fort Wayne, but Cameron Hunter’s corner three for the win was off the mark. It was ultimately too little to late for NDSU, who shot a meager 12 for 32 in the second half. Meanwhile, the Mastodons connected at a clip of 54.5 percent from the field and on 3-pointers. Scott’s 31 points led all scorers, and Harrell was not far behind with 26. Sixteen second-half fouls doomed the Bison, who sent Fort Wayne to the line 25 times in the last 20 minutes. The Mastodons capitalized, sinking 22 of their attempts from the line. The loss drops NDSU to 10-10 overall and 2-3 in Summit League play. It marks the first occasion since Jan. 9, 2016 that the Bison have dipped to a losing record in conference action. Losers in three of their last four games, the Herd are presently fifth in the Summit League, trailing South Dakota State, South Dakota, Fort Wayne and Oral Roberts. 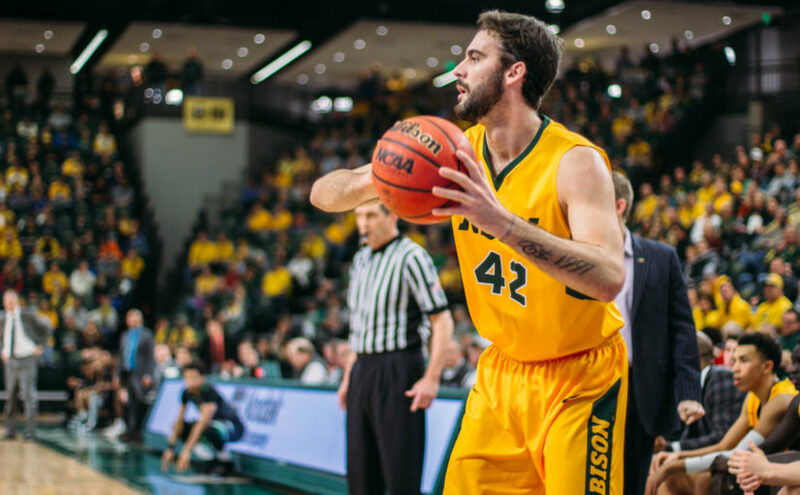 The Bison have struggled this season in games in which they have conceded 80 or more points. NDSU is 0-6 in such games. By comparison, in the 2016-17 campaign, the Herd were 4-2 when allowing 80 plus points. NDSU returns to the Scheels Center Thursday to face the 7-15 University of Nebraska-Omaha Mavericks.